Grind all the above ingredients to a fine powder. 1. Coarsely grind ginger, garlic and green chilies in the small jar of a mixie. 2. Heat 3 tbsp oil + 1 tbsp ghee in a heavy-bottomed vessel. Add sliced onion, 1 pinch of salt and stir for a few minutes. Next add ground ginger-garlic-green chilly mixture. Saute for 8 – 10 minutes until their raw smell is gone and then add turmeric powder, tomatoes and yoghurt. Saute for a few minutes and then add the biriyani masala powder. Mix well. Add salt, to taste. Next add the mutton pieces and mix well. Cover and cook stirring occasionally until half-done or for about 20 – 30 minutes (you can use a pressure cooker if the mutton is not tender). Open the lid and add chopped mint and cilantro. Mix well. Cover and cook until the mutton pieces are done and gravy is thick. Switch off the flame and set aside. 3. 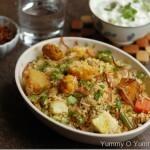 To cook biriyani rice – Heat 3 tbsp ghee in a large heavy-bottomed pan or a 5 or 6 liter pressure cooker. Add the whole spices and stir until fragrant. Next add sliced onion and stir until transparent. Add drained rice and fry for 1- 2 minutes. Finally add fried onion (if using) and hot water. Cover with pressure cooker lid and cook until steam starts coming out profusely. Put the cooker weight and cook for 3 minutes at low heat. Switch off. Open the lid after 10 – 15 minutes. The rice will be perfectly done. Fluff the rice gently using a fork. 4. To layer – In a heavy-bottomed vessel, spread half of the cooked mutton masala at the bottom. Top it with half of the cooked ghee rice. Sprinkle fried onion, cashews, raisins, chopped mint, cilantro, few drops of rose water and saffron milk. Spread the remaining mutton masala on top followed by remaining ghee rice. Sprinkle fried onion, a pinch of garam masala powder or biriyani masala powder, fried cashews, raisins, chopped mint, cilantro, saffron milk and 2-3 tsp melted ghee. Cover tightly with an aluminium foil. Bake at 400 F for 15 – 20 minutes. OR Heat a large tawa at medium heat. Once hot, bring down the heat to low. Place the biriyani pot on top of the tawa and cook for 10 – 15 minutes. Switch off. Let it rest unopened for another 10 – 15 minutes in the biriyani pot. 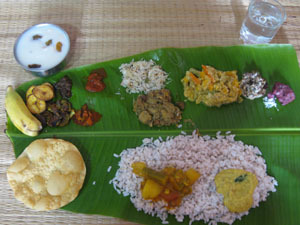 Serve hot with raita, biriyani chammanthi, pappadam and date-lemon pickle.